Seven Cities of Gold Ozark Softscape / Bill Bunten (U.S.A.), Electronic Arts (EA) (U.S.A.), 1984 Download it Now ! The Seven Cities of Gold is an adventure game. 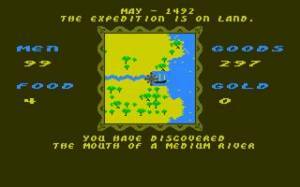 The player takes the role of a late-15th century explorer for Spain, setting sail to the New World in order to explore the map and interact with the natives in order to win gold and please the Spanish court.